A worsening of the ongoing economic slowdown in China, consumer of about half the world’s commodities, is the single biggest challenge mining and metals companies face this year, a new survey of senior executives shows. Beijing-related worries have already dragged industrial metals prices along and increased future demand concerns so far this year. This has led some to question whether the country’s government is doing what’s needed to stop the downward trend. Based on answers from 51 senior executives, lawyers White & Case say that trade tensions, which have ramped up due to US President Donald Trump’s aggressive trade policies with Beijing, are the second largest challenge for the mining industry in 2019, with 20% of the respondents indicating so. Markets seem to have absorbed the impact of the current raft of trade barriers — US import duties on steel and aluminium, and defensive safeguards from the EU and elsewhere in the world — and there is cause for optimism. 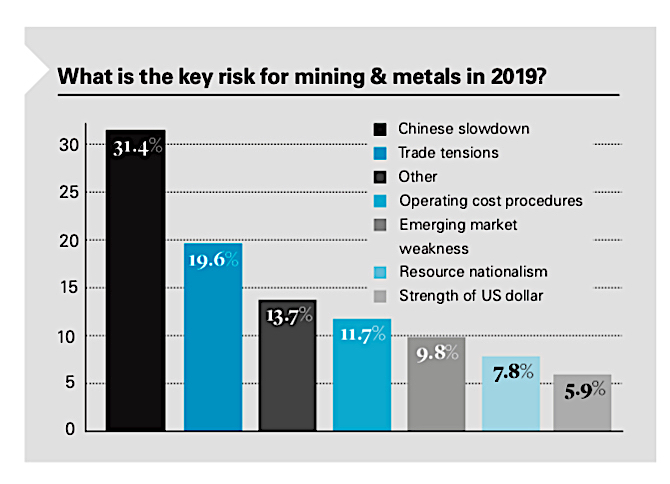 But White & Case’s survey results indicate that the main impact of trade tensions this year will be on speculative pressure on commodity prices, rather than any erosion of underlying demand for the hard commodities. Source: White & Case Mining & Metals Survey 2019. Companies, they say, will likely place mergers and acquisition on the back burner and focus instead on getting the most out their current assets, while increasing returns to investors. 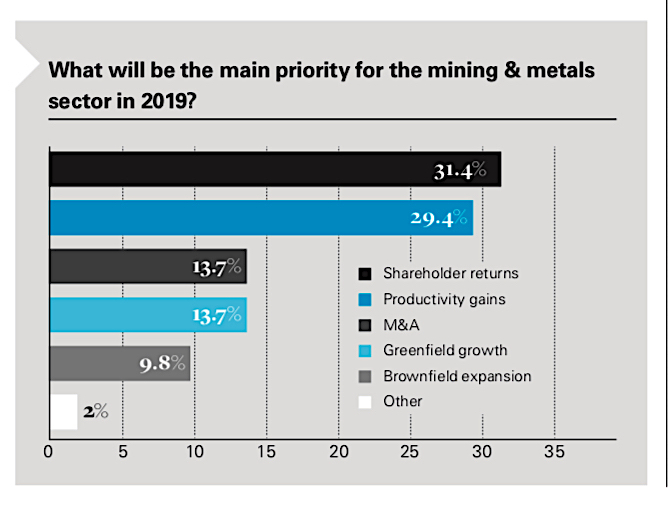 Shareholder returns will be the mining sector’s number one priority, according to 31% of the executives interviewed, closely followed by productivity gains, according to 29% of them, the report shows. “That’s a similar picture to what our respondents expected last year, when a similar percentage expected shareholder returns to be the main goal for management,” White & Case’s partners Rebecca Campbell and John Tivey write. “However, looking back to our 2017 survey, it was debt reduction that was seen as the keen focus, showing how successful the sector has been in moving from balance sheet recovery to rewarding investors. Another key issue the industry will have to address this year is the use of balance sheets to fund expansions. Given the wary approach to growth and lack of major deals, major producers have plentiful cash on hand to fund much of the limited growth they are pursuing, the experts say. 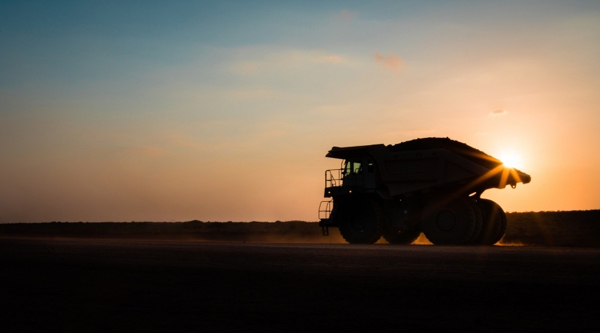 A case in point is Anglo American’s new Peruvian copper mine, Quellaveco. Its development will be funded through cash flow, while many of the additional brownfield expansions planned by the majors will be paid for from earnings. While the survey’s respondents expect to see a combination of financing this year, balance sheet funding is deemed as the most likely route, while raising equity is seen as the least likely, as investors are still reluctant to pay for new capacity. The one area in which mining executives expect to see real growth is the use of streaming and royalty funding, with two-thirds expecting an increase this year. Battery materials, including cobalt, lithium, nickel and copper, have been the most compelling ‘good news’ story in mining for the past four years, but 2018 will likely be remembered as the year when that enthusiasm faced its first real test. Cobalt, for one, hit almost $100,000 a tonne, but then came under serious pressure in the second half of the year as demand failed to match some of the more optimistic projects and a wave of new supply, induced by higher prices, is looming on the horizon. It has been a similar story in lithium, where new projects are being developed from Australia to South America, prompting price declines of more than 50% from their peak in late 2017. White & Case survey’s results, however, show the industry sees most of these metals rebounding this year, particularly lithium and copper, with 43% of respondents selecting the industrial red metal as their top pick. Faith in coal will be shaken further this year, the survey reveals, with more than 50% of senior executives predicting that the commodity will be the most impacted one by China’s continued polices to reduce air pollution. Rio Tinto has sold all its coal mines, while BHP and Anglo American have said the fuel will struggle to compete for capital against commodities such as copper. New entrants to the market are also constrained as banks and investors become warier of funding coal projects, even though the commodity remains the second-largest global source of primary energy, behind oil, according to the International Energy Agency (IEA). Lenders to the industry cut funding to $14.9 billion in 2017 from $22.5 billion in 2015, according to BankTrack, while at least 15 of the biggest banks have policies that prevent investing in coal projects. Resource nationalism is a near constant theme in mining, and 2019 is not expected to be different. 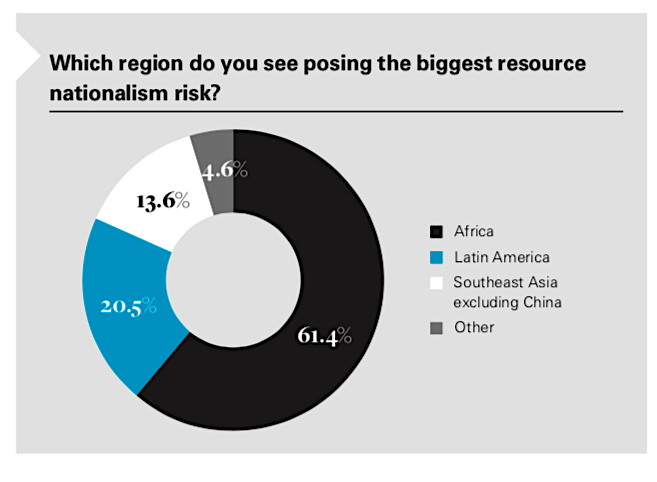 White & Case’s survey shows that while only a small percentage sees the issue as the biggest risk for the sector, 61% of them expects Africa to continue being the riskiest jurisdiction. Not everything is doom and gloom in the report, released on Thursday. The industry is actually making steady progress towards technological innovation, with blockchain becoming more than just a “buzz word” and being increasingly adopted for supply chain transparency. There already are some examples of its use in the mining industry, with the world’s No. 1 diamond producer by value De Beers testing its Tracr platform, which allows tracing gemstones throughout the entire value chain — from mine to buyer. This week, carmaker Ford and IBM announced they had partnered up with South Korean battery maker LG Chem and China's largest cobalt producer Huayou Cobalt to test the first blockchain project to trace supplies of the metal from Democratic Republic of Congo (DRC). The news was followed by MineHub Technologies and IBM’s introduction of a global mining and metals supply chain solution that applies the same technology.